At the end of the day tomorrow, the Federal Reserve is going to release the summary results from the Dodd-Frank stress tests for the largest U.S. banks, including U.S. Bancorp . While the word "stress" may make investors think there's something to be concerned about, there's little for owners of USB to lose sleep over heading into tomorrow. The Dodd-Frank specific stress tests look a little like an amped-down version of the Fed's Comprehensive Capital Analysis and Review (CCAR). That is, they will offer some similar capital-level insight, but without taking into account the all-important capital plans of the individual banks. So for investors waiting to hear whether USB will be able to increase its dividend or buy back more shares, that answer isn't going to come from the Dodd-Frank test results. 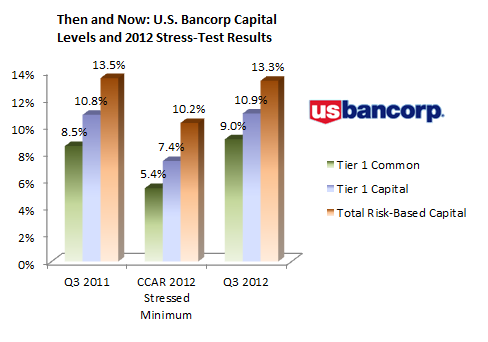 More importantly though, U.S. Bancorp aced last year's CCAR tests and looks even stronger this year. Source: Company and regulatory filings. Notably, the stressed ratios from last year's CCAR included USB's aggressive capital-return plans, which included a 56% dividend increase and a 100 million-share repurchase program. 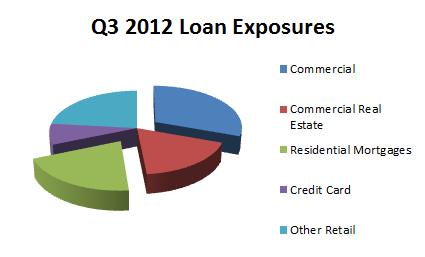 And as we look to USB's loan portfolio, we've seen loan exposures move slightly, but in regulator-friendly ways. Commercial real estate and residential mortgages were the largest increases in loans, while credit card loans barely grew and other retail loans fell slightly. While there may be a differing take on what this means from a business perspective, it's a positive in the regulators' eyes, as residential mortgage loans tend to carry lower risk ratings than, say, credit card loans. The latter is especially true for mortgage loans with lower loan-to-value ratios, and between 2011 and 2012, the portion of USB's mortgage loans with LTVs above 80% (that aren't backed by Ginnie Mae) fell. With all of this in mind, if we wanted to find something to worry about in the stress-test results release, we could fret about the fact that this is the first time the Fed is running through the specific Dodd-Frank stress tests, so there's the possibility of confusion as to what the results mean and how they relate to the CCAR coming out next week. I figure there's a good chance of that happening. But even a moderate level of confusion and nuttiness is unlikely to do much to push USB around. As I've outlined here, the bank is in a really good capital position. Maybe more importantly, though, much of the focus tomorrow will be on more, shall we say, "questionable" banks like Bank of America . My fellow Fool John Maxfield thinks that B of A is going to pass the tests "with flying colors" (I concur), but if there's any sort of maelstrom tomorrow, it'll be revolving around either B of A, or fellow beaten-up big bank Citigroup. Of course the stress-test results are only a small piece of the puzzle when it comes to U.S. Bancorp. To dig deeper on this bank and find out whether U.S. Bancorp is a buy today, I invite you to read our premium research report. Click here now for instant access. The article Stress Test Fears? Not at U.S. Bancorp originally appeared on Fool.com.